They'll fall in love with this pretty, playful bouquet! 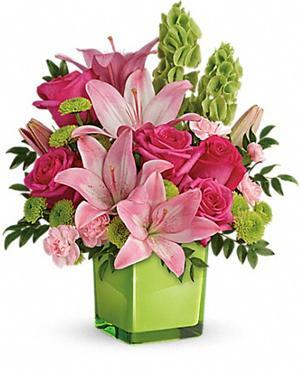 Pink roses and lilies look oh-so-lovely with elegant bells of Ireland and presented in our exclusive vibrant green Color Splash cube! It's a fresh mix they'll adore for any birthday, anniversary, or special occasion. Choose Four Seasons Flowers for fresh flowers in San Diego CA. Order today for same-day delivery! Green cube with pink roses and lilies.